Mackensie Alexander played 14 snaps after the Vikings lost Xavier Rhodes to an injury Sunday. Here's how Washington picked on him. Mackensie Alexander was suddenly a sought man at FedEx field. Adding injury to a 21-yard run during a tie game, Xavier Rhodes needed a replacement after a head-to-head collision with teammate Audie Cole. Defensive backs coach Jerry Gray turned to the only cornerback left on the sideline, the Vikings' promising second-round pick, and told Alexander to buckle up. Redskins quarterback Kirk Cousins, trying to take a fourth-quarter lead, also looked his way. "First play, they come at me right away," Alexander said. The future was Sunday for the Vikings' young cornerbacks. At the forefront was Alexander, whose lesson plan accelerated in a blink in Washington. He played 14 snaps after the Vikings lost Rhodes and were already without injured cornerbacks Captain Munnerlyn and Marcus Sherels. After Rhodes was hurt on Rob Kelley's big run, Cousins targeted Alexander for his two longest completions on consecutive field goal drives that were the difference in the Vikings' 26-20 loss. It was an early lump for the 23-year-old Alexander, who has now played 47 snaps in spot duty for the Vikings. He was pulled against Detroit after he drew a flag and allowed a touchdown. His inexperience showed again during Sunday's blunders. Let's start with 12 minutes left in the fourth quarter. Alexander subbed in for Rhodes at right cornerback and jumped into a man-to-man call on the outsides. 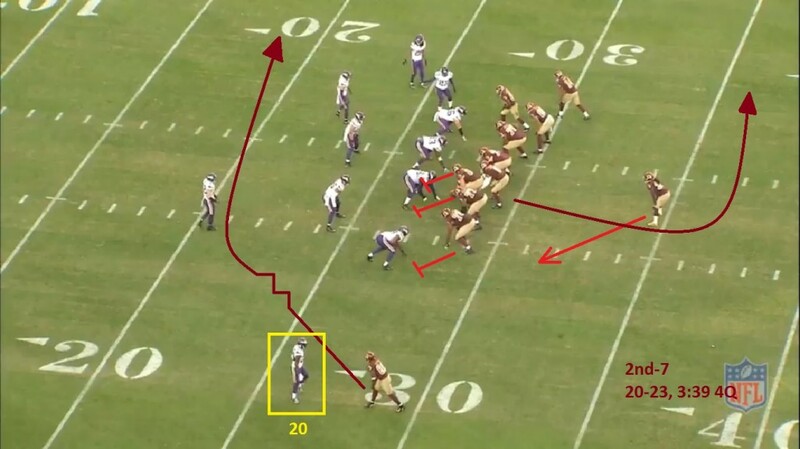 The Redskins had moved receiver Pierre Garcon around the formation while Rhodes was in the game, but kept the 6-foot receiver across from the 5-foot-10 Alexander (20) at the end. "Ran a dig route, they know we press a lot," Alexander said. "He got inside, bodied me." Garcon gains way too much separation from Alexander on the in-breaking route, which gives Cousins a large window to complete the 17-yard pass. The slightest hesitation, which happens again on the next drive, proves to be costly for Alexander. "Should've been tighter in coverage, but you know – my first play," Alexander said. "I was kind of jittery, going too fast. That's me not being disciplined, taking my eyes off my guy." Safety Andrew Sendejo, playing zone coverage in the center of the field, is the first to attempt a tackle on Garcon before Alexander recovers. "It's different stuff I have to learn coming into the game. When I come in, be ready," Alexander said. "I have to just prepare and be better with those things. It's definitely something I'm learning every day and a game situation is definitely different than practice." Click here if this video is not displaying. After the Vikings fall into a 23-20 hole, the defense is forced onto a short field following Sam Bradford's interception on a tipped pass. 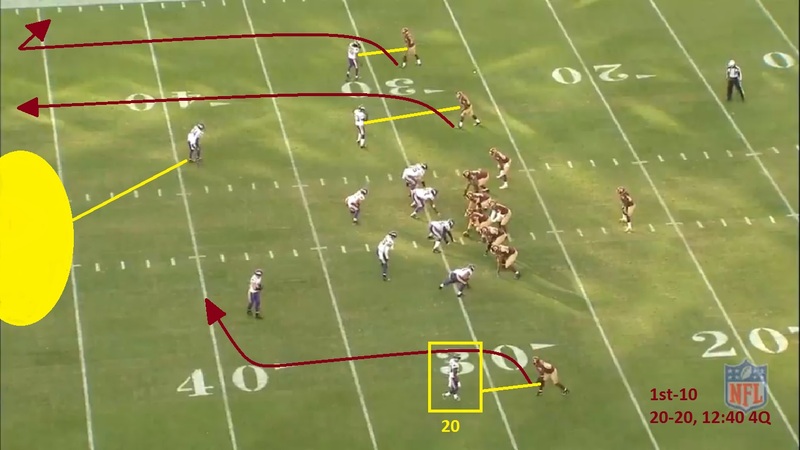 The Redskins call two runs in three plays to set up a play-action pass that would take advantage of Alexander's youth. "We're in a man-to-man call and I got my guy," Alexander said. "You read [run or pass] based off the receiver, his splits, if he goes inside. I was thinking crack [block] or the over route, also, but again it's about doing my job. Keeping my eyes on my job, which is the receiver." Alexander’s eyes drift to the backfield where he sees Rob Kelley mimic a carry. Garcon, lined up across from Alexander (20) at the bottom of the photo, runs a route that takes him inside, as if he’s going to come across the play and block a linebackeror ‘crack’ block. Garcon only accelerates once he’s past the linebackers and Alexander’s hesitation was enough to cause separation in his man-to-man coverage. 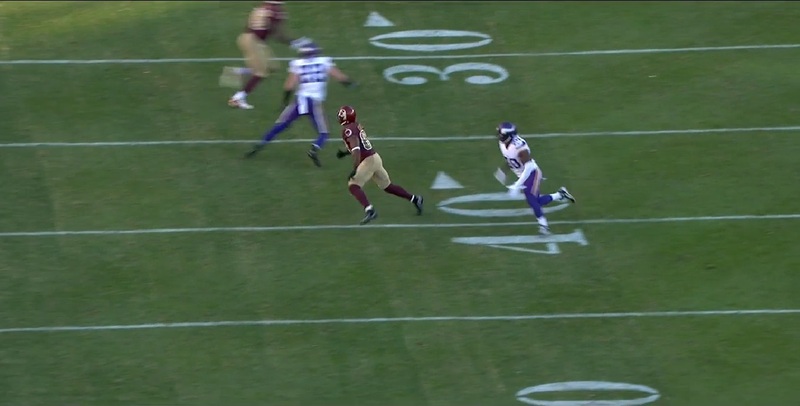 Garcon’s awarenessshows again when he slides in bounds to keep the clock running. Four plays later, the Redskins kick a field goal for the 26-20 lead that stood as final. "I see him coming across, runs an underneath route," Alexander said. "I chase him and stop and look for a little bit thinking it's run, because they play-actioned it. That's once again me not being disciplined, getting my eyes off my guy for a little bit and trying to make a play. "As soon as I looked, that half a second he takes off. I tracked him down, but he catches the ball anyway."